Cold infuse the vodka with tea overnight (measure: 1 tea bag per 60ml of vodka). Prepare ice in advance by infusing Ceylon cinnamon and the tea in freshly boiled water. Bring it down to room temperature and then freeze in to ice cubes. Prepare the Moroccan Mint Green Tea as per pack instructions. Let it cool down to room temperature and chill in a fridge. To make the Marteani add 30ml infused vodka and 30ml of the cold tea infusion. Stir for 30 seconds constantly over tea ice and strain into glasses. 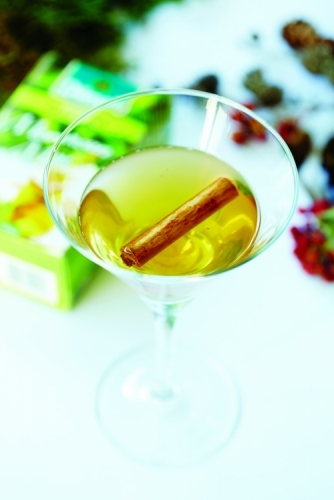 Garnish with a small cinnamon quill baton.